RADIO was inspired by the old logo of NPR, National Public Radio. Obviously, the line pattern suggests broadcasting. The letters are square and of a uniform width, great for short headings, drop caps, and the like. Includes caps, numbers, punctuation, and international characters. POPSTARS was inspired by the hand lettering on the cover of the classic Beatles album, Magical Mystery Tour. The B from Beatles is about actual size at left; weren’t vinyl album covers great? This pair of fonts can be used separately or layered as in the animation on this page. 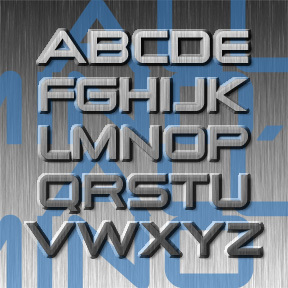 Each font includes caps, lower case, numbers, punctuation, and international characters. NEUROTOXIN was inspired by the Xerox Corporation’s former X logo, designed in 1994 by Landor Associates. Each letter is modified to appear to be forming from, or dissipating into, pixels, suggesting a transition from digital to analog and back. The basic letterforms are patterned after a bold Didone-type font. Serve with a nice Bodoni or even Times Roman. Includes caps, numbers, punctuation, numbers, and international characters. CARTEL was inspired by the logo of OPEC, Organization of the Petroleum Exporting Countries. Rigorously geometric to the point of near illegibility, Cartel could add an exotic touch in a futuristic or retro context. Includes lowercase (including long and short ascenders and descenders), numbers, punctuation, and international characters. AARDVARK CAFÉ was inspired from the famous Hard Rock Café logo. It’s a worldwide pop classic and seems to have been originally hand lettered. In rounding out the alphabet, I strove to work the little upstroke “wings” into all the caps and the swash-y descenders on the h, m and n to match the k. Includes caps, lower case (including some alternates), numbers, punctuation, and international characters.